I do most of my development on a remote server. Since I'm a bash + vim type guy, that suits me just fine. I usually use screen. This allows me to create multiple virtual terminals as well as detach from the session and reattach later, perhaps from a different computer. Twin can do all this and more, but in a user friendly way! I'm just getting started, but it sure does look neat! Very, very strange. I'm still trying to adjust to having a windowing environment within my existing windowing environment. Wow, that really is a double-take. I'm a rabid screen user myself, and I don't mind very minimal windowing environments like ratpoison, but having a mix of text and graphics as in that screenshot really throws me. Any chance you can do a write up about your configuration and usage of twin? Just starting out in Linux and love doing things thru the console. Would love to get this working and try it out. Tried to get it started and configured on my own. But keep on running into issues left and right. Did a search on Google for any other docs and configuration tips but did not get much information that was informative. Sorry, I only ran Twin for about a week. Normally, I log into the remote server with X11 forwarding turned on. Then I start screen so I can have multiple terminals without pain. If I need an X application (like gvim), I start it from that terminal, and it shows up on my desktop (which has an X server, of course). Hello! I installed twin on my ubuntu intrepid 32... i can run it on terminals in my desktop but cannot run in the tty. It says all display drivers failed... Maybe you know why? > i can run it on terminals in my desktop but cannot run in the tty. 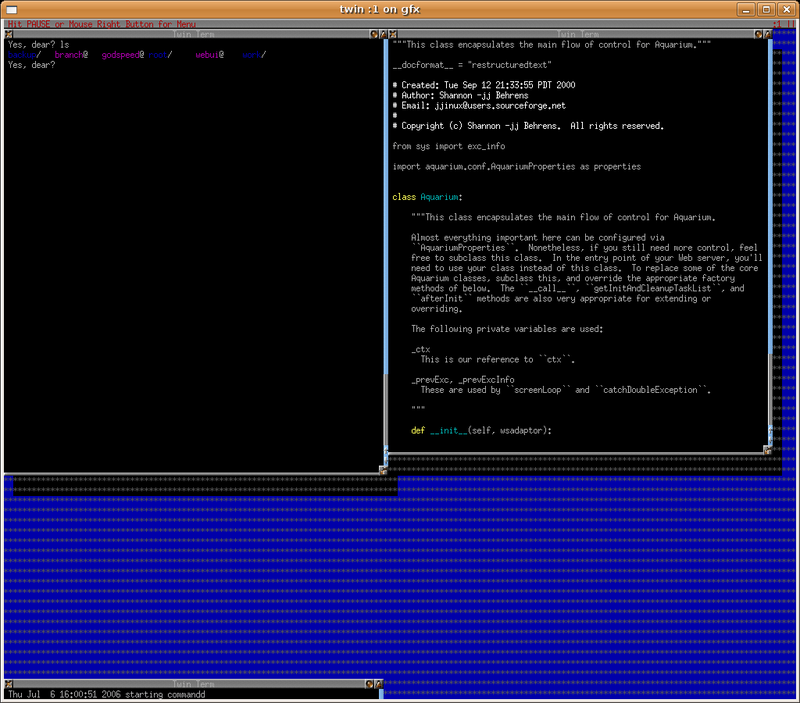 Can you send me (jjinux@gmail.com) a screenshot of what it looks like running in a terminal? I haven't run Twin in years, but I remember that when you run it under X, it actually makes use of X. There might be some options to give to Twin to tell it to "stick to the basics". Hi JJ, i readed your answer today. I'm sorry but after searching all around the web for months, i unninstalled twin and now i can send you an screenshot. I remember it said something like "twin has tried all drivers and nothing works"
I can send you, not. I CAN'T send you xD sorry! Don't worry, I use screen too. I think it's more reliable than Twin. Well Twin is still relevant even in todays world. Yes, it may seem odd at first to have a window manager inside of a window manager, but not any weirder than running Krdc with multiple tabs for multiple remote sessions via VNC or RDP. Basically, one way that Twin really shines is by using your pager, and dedicating a full page screen for Twin. 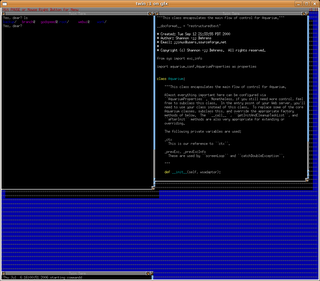 Then, you can open several twterms, remote into other boxes, and run tmux (instead of screen). That way, you have a birds eye view of several machines inside of terminal windows, each running tmux (or screen), so you can manage those hosts effectively. If the paged window that you maximized Twin inside of is in fact a remote Twin session itself, you can detach, attach, and even simultaneously attach to that twin session from multiple points at the same time from work, home, and school, for example. If you couple that with the power of running tmux on each of the remote ssh sessions in many twterms, you have something really, really kewl. Twin is very stable too. The current version is 0.6.2 and this window manager has come a long long way since it's introduction to the UNIX world years ago.